The Titanic departing Southampton on April 10, 1912. Fate: Hit iceberg at 11:40 PM on 14 April 1912. Sank on 15 April 1912, at 2:20 AM; wreck discovered in 1985 by Robert Ballard. Passengers and crew who died: Unknown precisely but estimates place the figure at about 1,500 casualties. The RMS Titanic  was a British passenger ship. It was built by Harland and Wolff ship builders, in Belfast, for the White Star Line company. She sank during her first trip at sea. Before she sailed, many people thought it would be almost impossible for ships of this design to sink. Titanic-New York Herald front page. Wrong numbers were posted the first days after the accident. At 11:40 PM on 14 April 1912, during the Titanic's first trip, she hit an iceberg in the Atlantic Ocean. The iceberg broke the Titanic's hull (bottom), letting water into the ship. 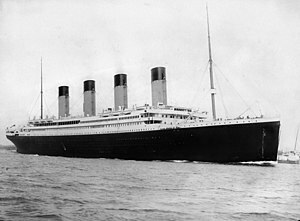 The Titanic sank two hours and forty minutes later at 2:20 AM on 15 April. As she sank, the Titanic split in two. The wreck killed over 1,500 people. Only around 705 people survived. It was one of the worst shipwrecks that was not during a war. One reason why so many people died was that the ship did not have enough lifeboats for everyone on board. The Titanic had 20 lifeboats with room for 1,178 passengers, only a third of the number of passengers the ship could carry. It actually had more lifeboats than was needed by law (it needed 16 with room for 990 passengers). This was because the laws in the UK were out of date. They did not say that a ship needed enough lifeboats for all passengers. They only said that a ship weighing more than 10,000 tons needed 16 lifeboats (the Titanic weighed 46,000 tons). Furthermore, the White Star Line believed that the lifeboats on the Titanic would only be needed to take passengers a short distance to a rescue ship. Higher class women and children were allowed on the lifeboats first, and passengers who sailed in first class (which meant that they paid for better rooms on the ship) were allowed on before other passengers. Few of the poorer people who had paid less (called second class and third class passengers) got out safely. Another reason so few people survived was that the radio was off on the SS Californian, the ship closest to the Titanic. The Californian crew did not hear about the accident. Another ship, the SS Carpathia, did hear about the accident and collected all 705 survivors. The last survivor of the 'Titanic disaster to die was a woman named Millvina Dean. She was the youngest passenger on board, as she was then a baby of only nine weeks old. She died in Ashhurst, Hampshire, England on 21 May 2009 aged 97. The Titanic disaster changed many maritime ship laws. Because so many people died, authorities felt that laws should be put into place to make ship travel safer. Changes included requiring all ships to carry enough lifeboats for everyone on the ship, and emergency materials such as flares. Someone must be at the ship's radio all the time. The wreck was found by a French and American team, led by Robert Ballard, on September 23, 1985 at 1:02 in the morning. In 1986, Ballard returned to the wreck with a submarine. He took many photos and made lots of films. In 1987, a French team salvaged 900 objects and took them to the surface. The story of the sinking has been made into several movies. The most popular film version is a 1997 film starring Kate Winslet and Leonardo DiCaprio called Titanic. It won 11 Academy Awards, tying Ben-Hur for the record for the most Academy Awards won by one movie. Other movie versions of the story include the 1958 film A Night to Remember, the 1953 film Titanic, the 1979 film S.O.S. Titanic and the 1996 movie Titanic. In the 1980 film Raise the Titanic, salvagers raise the shipwreck from the bottom of the ocean to the surface. However, this is impossible to do in reality. The Titanic broke in two, and the wreck is partially stuck in the bottom, buried under more than three feet (1 m) of mud in some spots. The ship has been on the ocean floor for more than 100 years, and would shatter into many more pieces if disturbed. Worms and other animals have eaten away much of the wood and many other parts. ↑ RMS is an acronym. RMS stands for Royal Mail Ship or Steamer. RMS is a ship prefix for vessels that carry mail under contract to the British Royal Mail. ↑ "FACT CHECK: The Unsinkable Titanic". Snopes.com. ↑ "Kids' Games, Animals, Photos, Stories, and More -- National Geographic Kids". Kids. ↑ Brett, Allan. "Radio Story". This page was last changed on 15 April 2019, at 19:52.